This two-phase subdivision is located off Country Club Road in Lake Mary. This neighborhood is unique because it offers nice size wooded lots with custom homes. This well-established neighborhood has no HOA! 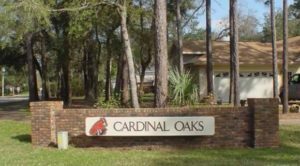 The original Cardinal Oaks division has approximately 100 lots with custom homes that were built between 1979-1990 so some homes may be a bit dated or need some updating. The original Cardinal Oaks division has approximately 100 custom homes that were built between 1979-1990 so some homes may be a bit dated or need some updating. Prices range between $275-$325,000. The phase II Cardinal Oaks Cove features 111 custom homes that are a bit newer, built between 1987-1992. The homes here are typically larger and offer a new feel inside and out. Prices range approx $350-$400,000, although homes located on Lake Mary can be significantly more. If you prefer a more open, custom community, with no HOA that is still centrally located Cardinal Oaks is a place you should consider. Of course, all of Cardinal Oaks is zoned for top rated Lake Mary Schools including Lake Mary Elementary, Greenwood Lakes Middle School and Lake Mary High.